Weatherman, Weatherman, What do you see? What is the weather going to be around me? Well if you are on the East Coast, the answer is who the Hell knows. Every day it is something different. We literally went from 9 degrees to 46 degrees with in a day. Now I don’t mind running in all types of weather as you really have to do what you have to do. Some days that might even mean hitting the treadmill, but those are rare days. What is driving me a little batty is that every day is something different. Case in point – 3 runs within 4 days. Each day was something drastically different. The last run where it was warmer, I made the mistake of checking the weather. The weatherman lied about when the rain was coming and I got caught in a torrential rain too. Boo, weather people. Boo! It is making it so hard to figure out what to run in. Now I’m not one to be cold, but I also don’t like overdressing for a run either. These changing temperatures are making it difficult to know what to wear. Normally in February it is easy to know what to wear. Layers, Layers, and then some more layers. And while that may be true some days this February, it is not true every day. Do I need to cover my head? Do I need gloves today? Do I need a jacket or will my vest be enough? Again, who the Hell knows. A lot also depends on pace, because with a slower pace. Today, although not a faster pace is fast enough. Pretty much sums it up. But I always go on the side of regretting wearing too much than too little. This is why at the end of some of my races I look a little like a bag lady. But this system works for me. It might not work for everyone and that is what I love about running. To each their own:) The trick is to find out what works for you which can also change on any given day? The day after my epic coming of the rails run, I had a 14 miler to do. I planned this one a little better as I knew that the whole point of this run was to run on tired legs. My legs were tired. It was still hotter than Hell, but I was determined to make it a good run. First I decided that I would go later in the evening. It is hard knowing that you are going to start a long run that won’t finish till the 10:00 PM news comes on, but still better than running in the heat of day. Second, I plotted out a route that would allow me to meet some of my fellow MRTT Mama’s for miles 3 through 8. They were supposed to be running a slower pace and I thought it would be good to have company for some of the run. It was just what I needed even if they had me going a minute or so faster for those miles than my legs wanted to go, but still worth it. As Janna pointed out, I did miss my tempo run the day before:) I even had Helen run with me for an extra mile once the group was done. She thankfully slowed down and it was nice to run with her as I don’t often get a chance. Then it was time to do the last 4 1/2 miles by myself. At first it was hard, but then I realized that it was only because I forgot to put my music back on. For the record and safety, when running on roadways I do NOT use headphones at all. I play my music right from my phone. I also stopped at the local 7-elleven to refill my water bottles with cold water as I really hate warm water. The man at the counter looked at me and all my lights a little odd as did some of the people in the parking lot. Not sure if it was how sweaty I was because I was a hot, hot mess or the lights. Either way I went on my way. shortly after this stop, I had a group of teen boys (God, please don’t let my boys be this obnoxious) yell at me that I should wear reflective gear while running, but in a sarcastic tone while laughing at me. I just yelled back, “you think?” Then under my breath said a few things I will not mention on my blog. This did get me thinking. What do people think the point of all m reflective gear is? I have been doing most of my runs ALONE at night with some of the streets not having good lighting. I want to see where I am going and I think more importantly, I want to be seen! Truth be told, I worry about drivers when I’m running during the day. I worry more about drivers when I’m running at night because most are not expecting people to be out when it’s dark. I’ve said before, my goal for every run is to make it home safely and if looking like a Christmas tree helps you see me at night, I’ve got no problem with that because you know I love Christmas trees! 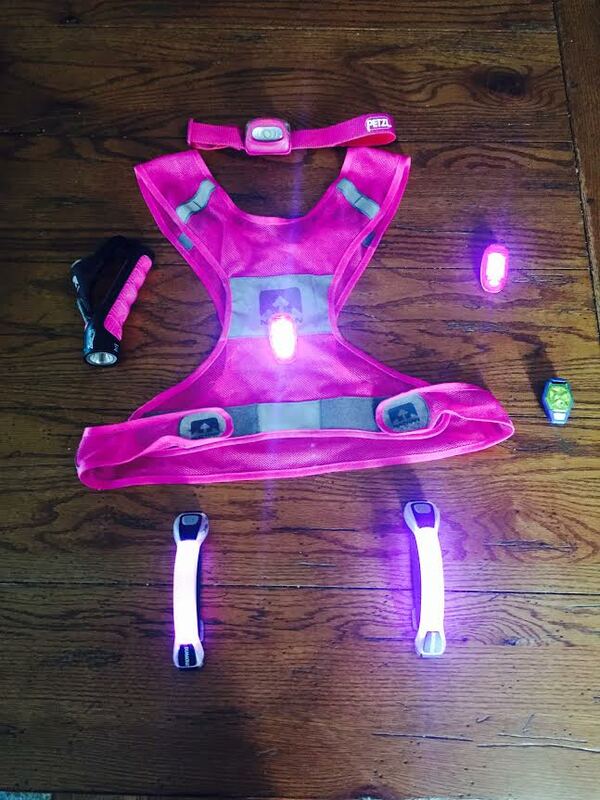 So what do I wear…..
What do you use for night running? Water, Water everywhere and Not a Drop to Spare! If you live in Jersey, you are used to hot and humid summers. Summer heat is great when you can lounge at the pool or surf the waves at the beach. It’s not so awesome when you are running in it. The last few long runs I’ve been lucky enough to have days so hot and humid that my town even has cooling centers due to heat advisory and air quality. I’m a firm believer though if you wait for the perfect conditions to run, you will never run. 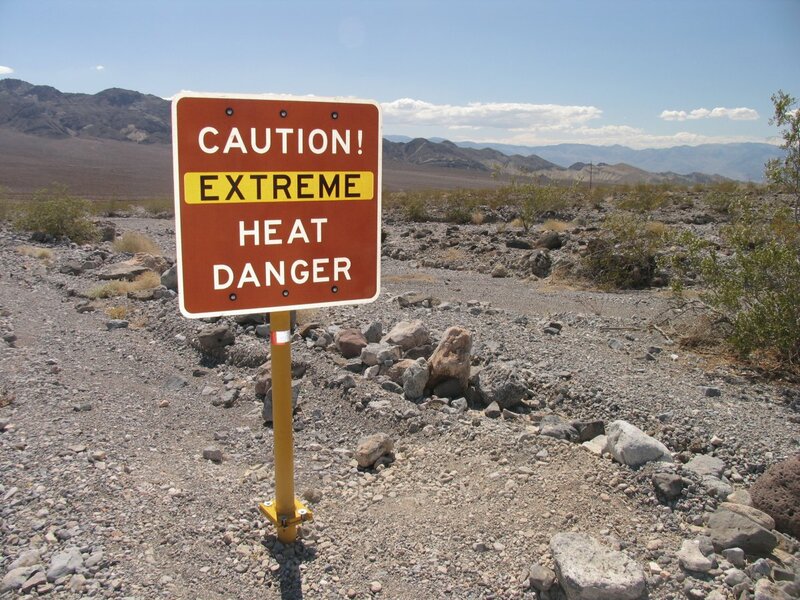 I’ve run a lot of long runs in extreme heat. A few of my MRTT Mama’s are joking that they think that I am training for Death Valley. I’m not but I sometimes feel that way too! Even though to those driving by me running on an 87 degree day with 66% humidity, I may seem stupid, I will say that I am not. This is not to say that during my run I’m not thinking the same thing, but I do really put some thought into my runs and I do take the weather into account. Unfortunately, for me many of my runs are during the day. If I was one to wake up at the crack of dawn I might not have this problem, but I like to sleep. So I have adapted and adjusted. Here are four things that I always do for a long run! I do not go out empty handed. Actually, I do because I have a Fitletic Hydration Belt; but I ALWAYS have water. My belt has 4 bottles that allows me to carry 24 ounces of water. I map out my run to utilize routes that usually have the most shade. I may not (ok never) follow my map exactly, but it is a nice general guide. I adjust as I go. Go slow!! This is easy to do in the heat when your legs become heavy the further you go, but so many people try to maintain their pace in the heat. Don’t! Also as a side note, if you can perfectly end your 15 miles at a Dunkin Donuts you are golden! Nothing like an iced caramel latte to help cool you off and put back any calories you may have burned off! I will not lie, yesterdays 15 miles in the heat was a killer. By the time that I got home, my clothes were literally dripping with sweat and felt like I had been swimming in them. Yuck! That being said, I do keep thinking that once cooler weather comes that all this pushing myself in the heat is going to make for some nice fall running or at least that’s what I tell myself! I have also come to the realization that it just might be time for me to take my hyrdation up a notch on my runs. I’m looking at hydration vests. I realized yesterday that as soon as I run out of water, I wilt. Then I thought about heading to the hills of Vermont where there are no local friends homes to stop. So it’s once again shopping time. I am so glad that running is a sport that is free. Ha!!! I had a great run yesterday. It wasn’t because I was fast because I wasn’t. It wasn’t because it was easy because it wasn’t. It was great because I had the support of my fellow Mama friends to gt me through it! Yesterday I needed to do 12 miles. I didn’t feel like doing it. I couldn’t do it in the morning since I knew that I wouldn’t have enough time to get it done while my youngest was at his summer program. I didn’t want to do it during the day, so that left the evening. Unfortunately, I couldn’t get out the door till around 7:00. I literally was running down the street as my husband was getting home. Hey, dinner was on the table! What more can a man ask for? Anyway, I thought that I would be fine to be back before it got too dark. I thought I went out prepared. 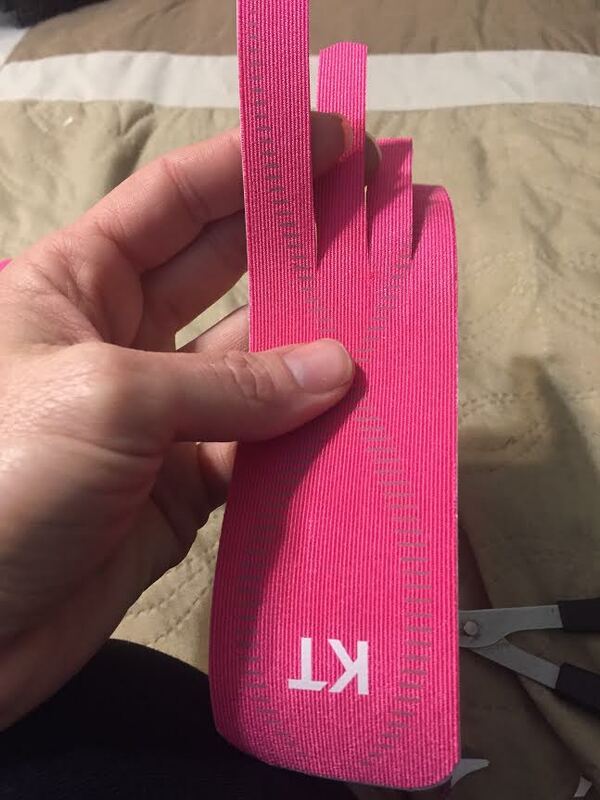 I wore my pink reflective vest, socks, and wrist bands. I even work a small light on my visor. Then about 5 miles into it, I am beginning to realize that I made a slight miscalculation on the sunset. I ask Siri what time the Sun will set and find out that I miscalculated by more than a half an hour. At this point, I am literally miles from home. 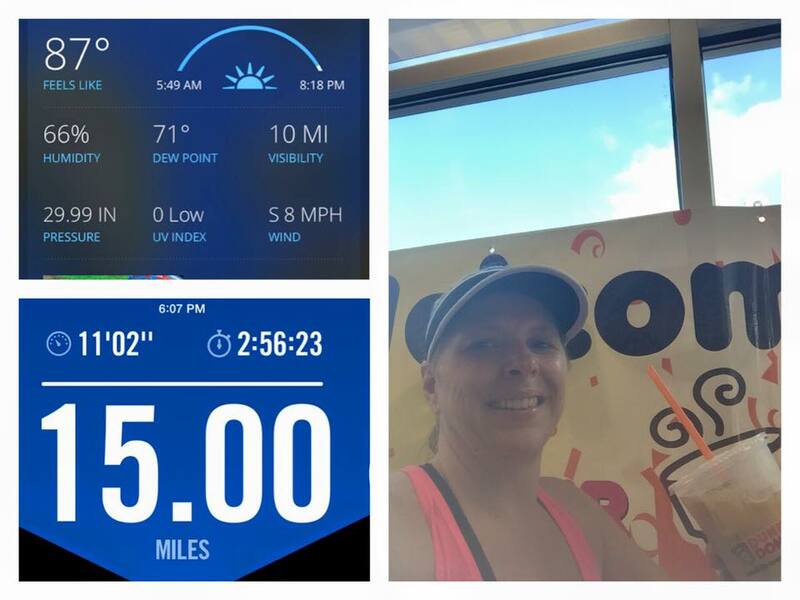 I didn’t want to have to call my hubby to pick me up and I wanted to get my run all the way in considering this was my first real week of marathon training. Don’t want to get off on the wrong foot. It’s not dark yet, but I know it’s coming. What’s a Mama to do? My long running routes, I usually loop to a local park. A park with facilities and water fountains that I use to refill my bottles with. As I was getting closer to thus particular park, I messaged the queen of night time blinky running, Janna. As a plus, she is also only a 5 minute drive from the park. Unfortunately, she was in the midst of a piano lessons but informed me that Dawn was at the park. She told me that if Dawn didn’t have any blink on her that she would sent some back with her. As I was running in the park, I started to call Dawn but then saw her across the parking lot! Once I caught up with her, she informed me that unfortunately she did not have any blinky on her but would happily bring me back some after picking her daughter up at Janna’s! So while waiting for Dawn to come back, I ran a half a loop around the park with another BAMR from my MRTT group that Dawn had been running with. Then Dawn came back. Suited me up so that I could safely make it home and off I went. I finished the run, but did get slower as the miles went by. More so because I wanted to be safe and visibility wasn’t that wonderful. My headlamp may be good for camping, but it is not a running headlamp. I did change my return route up a bit to stay on streets that I knew had some lighting. By the time I got home it was dark, but i got in my 12 and that is really my goal. To top it off my pace was off the whole run too. I should have been running at a 10:45- 10:55 pace, but ended up running an average of 11:09. Part of that is because I didn’t double check my pace before I left and really thought that I was supposed to be running an 11+ pace as I have been. My bad. Although, I don’t know that I had a faster pace in me anyway. I guess I will see next time! What is your favorite night time running accessory? This was recommended by my podiatrist and it is one of those things that hurts so good. A iced water bottle. This is probably the cheapest trick in my bag of tricks, but it feels so good. Plus, I can pop the bottle out of the freezer and roll my foot out while making dinner or any time of day. I usually start off the day by stretching my calf before I even get out of bed. Then there are a few that I do during the day, but by far, my favorite stretch is to have my toes on the stairs and just bring my heals down. 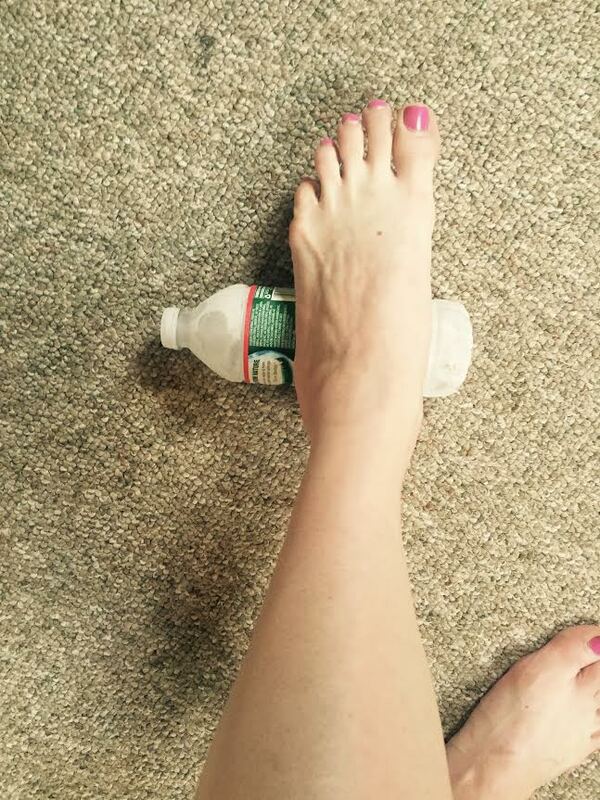 I just started doing this and it has already made a huge impact on my feet. It only takes a few minutes to do and I haven’t even noticed the tape while running. I had a pair made and they are in the process of tweaking them because the arch was made too high on one which was making the pain slightly different. More in the arch of the foot, but still not alleviating the heal pain. That being said, I could tell it was making a difference overall. I was sorry to give them back, but hope to have them back in my shoes in another week. Have you every dealt with foot pain? Friday Five – Where is all Your Stuff? I would like to say this is what it looks like everyday, but it doesn’t. This is what it looks like after a clean up. To be honest, this is what it looks like most days. Not too bad, but not as good as when I first organized. Some days worse, but you don’t need to see that! 1. Bags – different activities require different gear. Therefore, I have these things in their own bags that I can just grab and go. I’ve got a yoga bad, a running bag, a gym bag, and a swim bag. Might seem overkill, but it works for me. This way when I’m heading out I can just grab the right bag. 2. 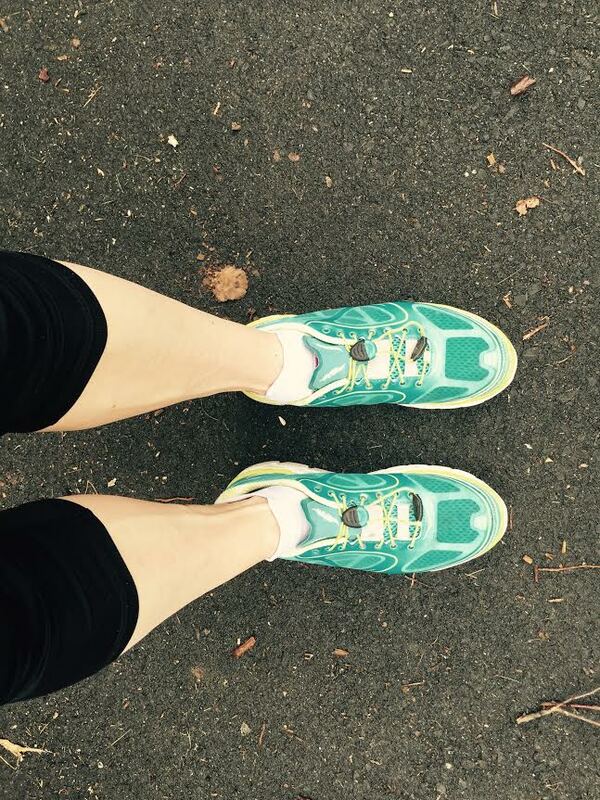 Shoes – I don’t know a runner who only has one pair of running shoes. 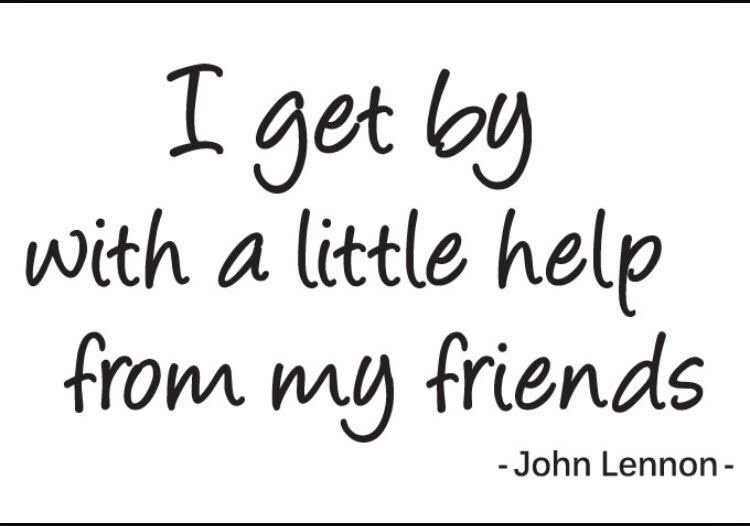 Maybe this is just the runners in my circle, but most of us have several pairs of shoes. Plus we find it hard to let go of our old ones. I keep my shoes under my bed which is right next to the bins in the picture. This way everything is right there for the taking. The back bin holds all my aforementioned bags. The front bin which has a lid holds miscelanous items that I need but not every day – night running vests and lights, extra belts, ect, ect. 4. 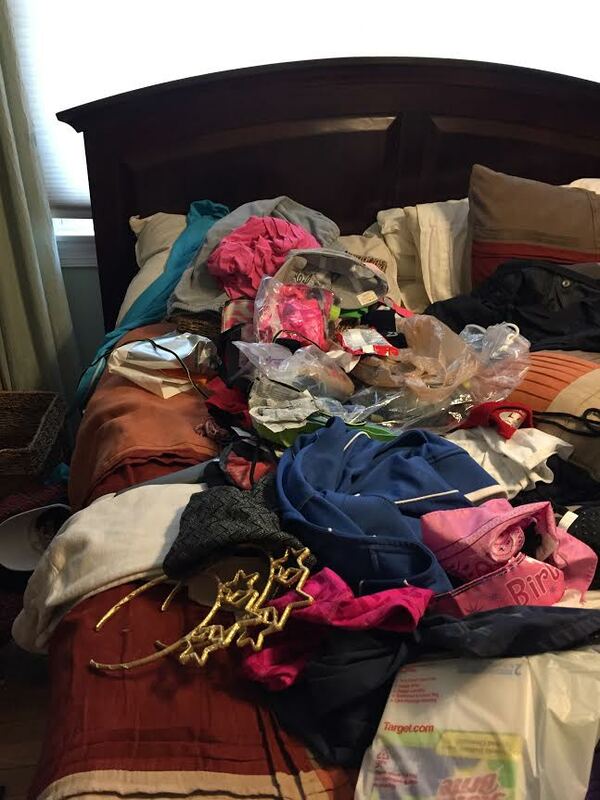 Bags, Bags, Bags – Under my bed, behind my shoes is a bag filled with tutus ( you know I have more than one!). In the bins, I have my extra belts in a bag, my night time running equipment in a bag, my race day stuff in a bag. You get the idea. 5. Clothes – Just like I have to change out my normal wardrobe by the season, I change out my running clothes by season. Then all my running shorts, pants, shirts ect will fit into one of the bigger drawers in the dresser. I have a hook to hang vests and jackets above the bins. I don’t know about you, but it seems like my workout clothes, gadgets, belts, ect are multiplying. Now some of this may be because I have bought a few things here and there. When I first started working out, I took a trip to Target and bought some lovely workout wear thinking that I was good to go. Then I realized that this only covered the basics. As I mentioned in a previous post though, I have a few different “gym” bags for various activities as each requires specific items. Gym Bag – This would be considered the traditional gym bag with lifting gloves, workout towel, jump rope and such. Swim Bag – Goggles, swim cap, towel, shower items as I like to wash the heavy chlorine scent off before leaving. 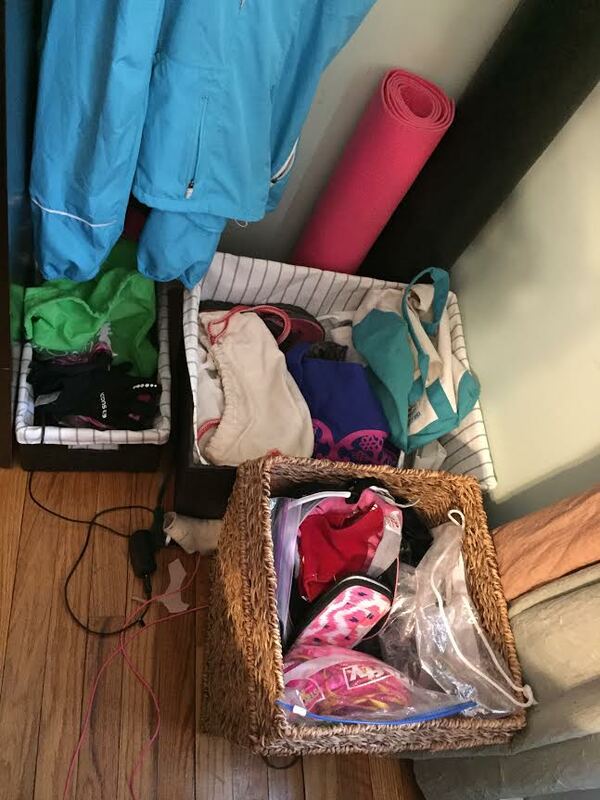 Then you add running jackets, watches, rollers, hydration belts, regular belts, ect, ect and before you know it, my workout gear has taken on a life of it’s own or at least a whole corner of my room. Now I don’t mind that it’s taken over my corner, but I do mind that it’s a hot mess. On top of that it was getting very hard to find anything. It was time to realize that something needed to be done. What needed to be done required a trip to Target again. I hit the organization section and found two different size storage bins that would help. I already had one bin with a lid. Although, I had been trying to pretend that I didn’t need more storage, I was only fooling myself. Without further ado, I will show you the before and after. 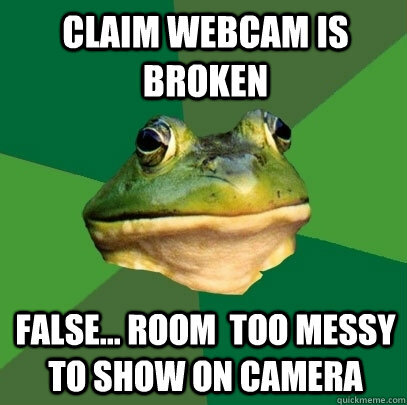 Yes, I am embarrassed but these things happen to a busy mama and I just forgot to take a picture. I did take one after I started and I had dumped everything all over my bed. I feel a peace and tranquility now. And lastly, things are neat. The bigger bin has my various bags and extra bags. Smaller bin has things that I might need on the go. The taller bin which has a lid now hold things that aren’t used frequently such as night time running gear, extra belts and such. Slowly I’m making progress. I even started organizing my kitchen too. 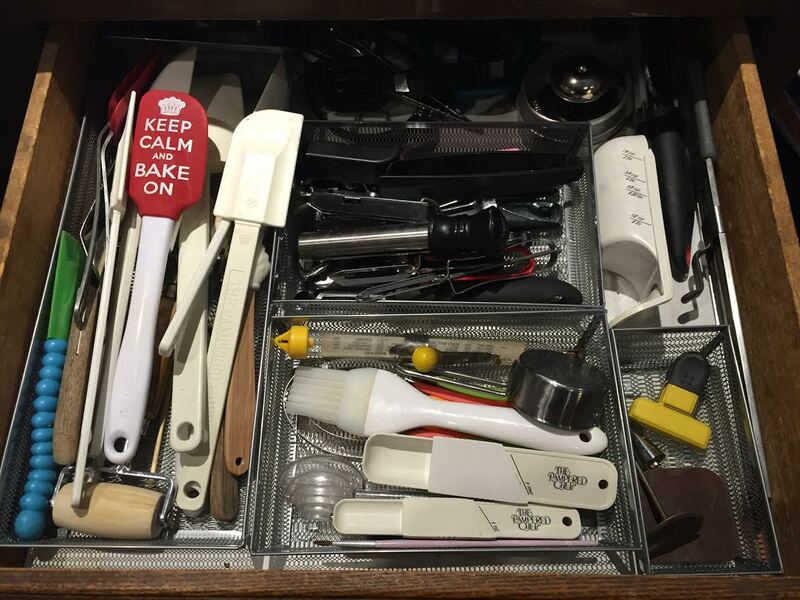 One drawer at a time. It may take a while, but I do feel like I’m getting there. Maybe by the end of the year, I will be fully organized. The Most Expensive FREE Sport Ever! We’ve all heard the expression that anyone can run because it doesn’t cost anything. Now I don’t know who said this, but they are an idiot. From the outside looking in, it may appear that running is a “free” sport as there is no charge to run in the street. I would love to think that running is a free sport. I would further like to convince my husband that running is a free sport, but he is a smart man and an accountant at that so I believe he knows better. 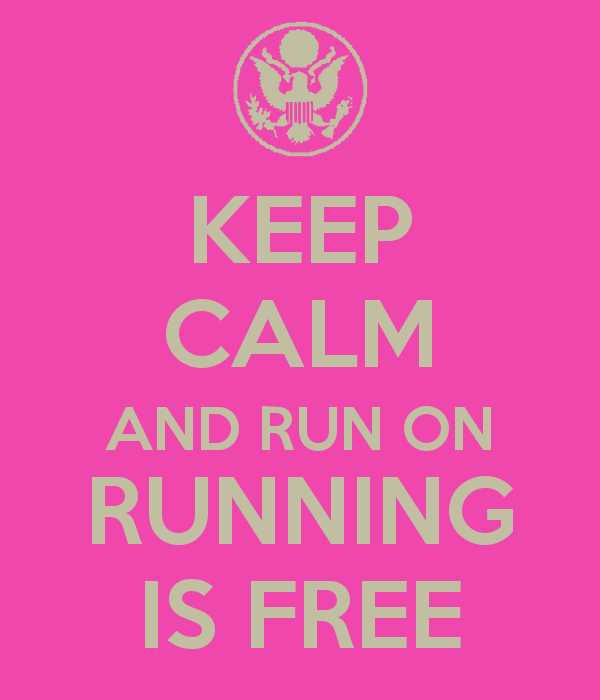 Yes, I would like to think that running is free, but I am only fooling myself and no one else. The second hydration belt I bought because I liked the waterproof pocket of it compared to the first one WAS totally necessary. The shoes that need to be replaced as the miles add up. The shoes I bought that didn’t feel right when I used them that needed to be replaced (plus they squeaked). The Gu by the case from Amazon to keep me going. The running tights, the sports bras, and on and on the list goes. We won’t even get into race fees here as I’m just talking about “gear.” Yes, running does not have to break the bank, but I think once you hit a certain point in your running you do need to dip into the Piggy Bank not just to prevent injury but also for comfort. As the weather changes, I am an the search for the perfect running jacket. Yes, I did buy a nice jacket recently. I really like it, but I’m not sure if it will be the right jacket for me to run in. This may end up being only something to run in when it is REALLY cold and snowy. This will also be a great jacket for playing in the snow. I do know that I tried to use it for my half this past weekend and I got too warm in it relatively quickly. The temperatures at the start was in the mid twenties. Underneath the jacket I had a base layer of a long sleeved under armour and a short sleeved heat gear shirt. Yes, I do know that I tend to run hot so for me this jacket might not be the right fit to run in or I need to adjust my layers. So off I am looking for another jacket when I’ve already made a decent investment in one and it is driving me nuts. (For those curios – I got the Athleta Maribel Ski Jacket on sale, of course). I think I need something more breathable, but I also want something waterproof. In my search, I have found many jackets that I would get in a heartbeat if I wasn’t worried about the price. Then there is also the part where you think that you are getting something that will fit your needs and realize that it doesn’t. Case in point the jacket that I just bought. Sometimes you need to take things for a test run to find out and sometimes you need to take it on several test runs. I’m not giving up on my sleek warm waterproof jacket, but I know that I need other options too. And so it goes with running in a place with fluctuating temperatures. Just like your normal wardrobe, you need different things for every season of running. 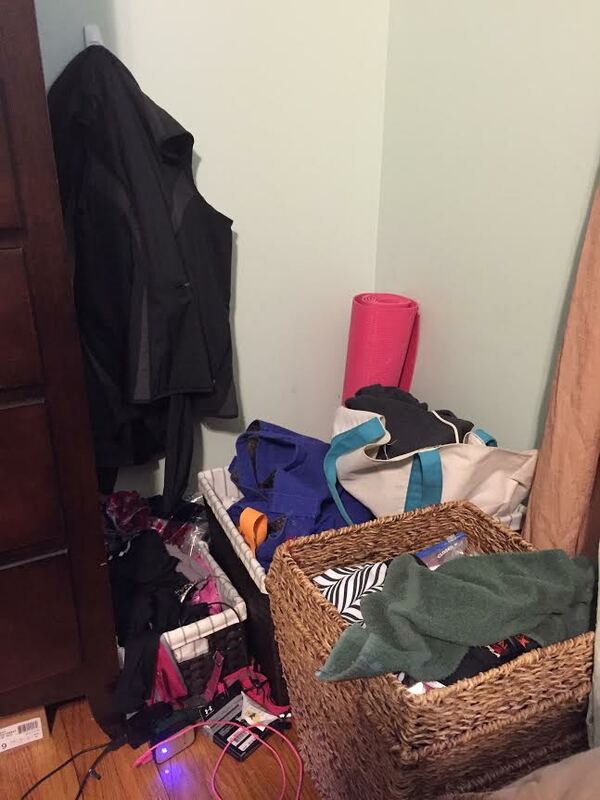 Admit it, you’re running gear is busting out of the drawers too or is that just me?